Off The Cuff | Classic. Modern. Style. If you are trying to track down that perfect Yalie bag, it might be worth looking to the Brits for inspiration. 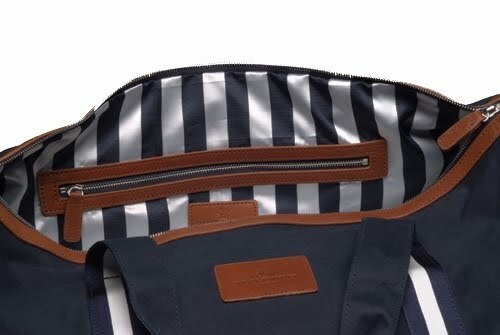 Smart Turnout’s new Yale University Canvas Holdall has a beefy exterior belying a clever blue and white striped silk lining. While I have not gotten my hands on one yet, Smart Turnout is a longtime friend of OTC and we’re pretty sure this bag has the stuff we like. 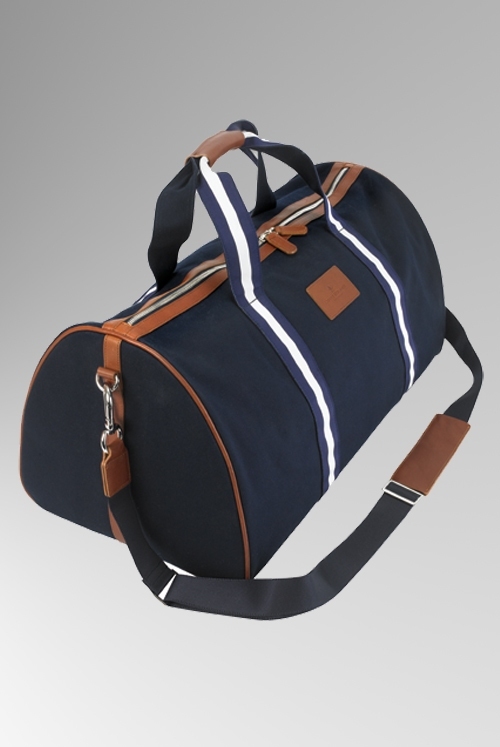 Thick canvas, sturdy leather trim and heavy zippers add substance to its preppy functional coolness. It looks to be about the right size for an overnight trip up to Boston for The Game or lugging provisions to your buddy’s tailgate shindig. Once you’ve sufficiently beaten it up, I bet this bag would even be a nice Friday office bag. 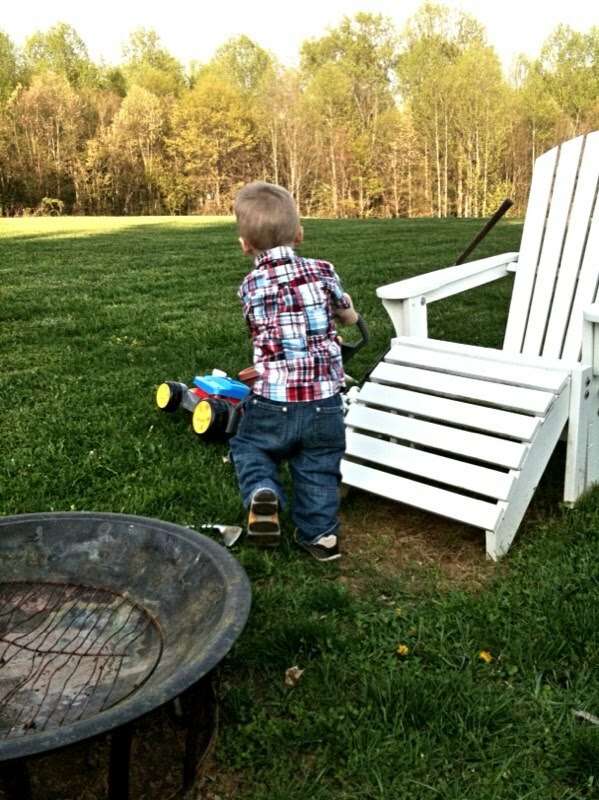 The family OTC recently got together with some friends on a warm Spring evening for a relaxed birthday celebration that included bocce and the random chipping of golf balls. Add in some Dogfish Head 90 Minute, and it was a nice time indeed. 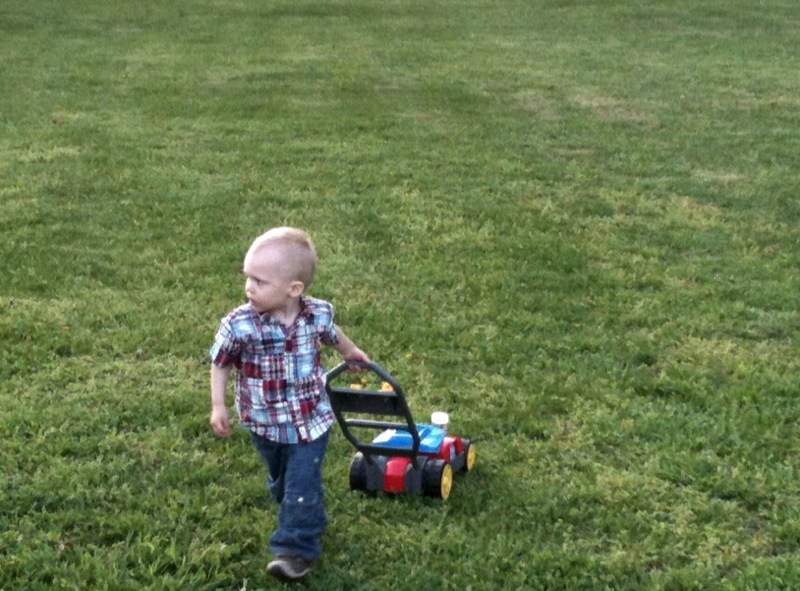 While we all tried to achieve a certain “lawn party” casual look, no one did it better than my own little BFH. Patchwork madras camp shirt, vintage American work-wear carpenter jeans, and a snappy bucket hat, lost somewhere out on that sprawling lawn. I never looked that good at his age. So, is the summer scarf fashion or fad? If it’s warm outside that automatically makes the use of any kind of scarf that of a fashion accessory. And that, my friends, is a recipe for manly disaster. Except that I’ve actually tried it out and, well, I kind of like it. When it comes to styles that appear even slightly effeminate, like lightweight scarves in warm weather, American men tend to reflexively run the other way. European guys seem to make such accessories look annoyingly cool and natural. 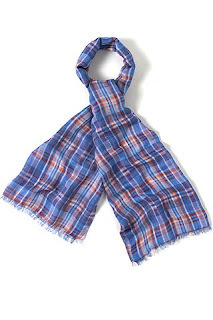 Though not implying that I hang out at chic street cafes and tool around DC in an Aston Martin Vanquish, I do indeed have two summer scarves, both from Drakes-London, one of the forces promoting this look. Since Drakes had actually given me my scarves for free I felt an obligation to man up and try them out, and so I did. While obviously impractical for high summer – though lightweight they really do retain heat quite well – for a cool or breezy evening, they are very nice. And let me just point out that if Michael Drake thinks summer scarves are cool, manly and totally masculine, you best reconsider your opposition. 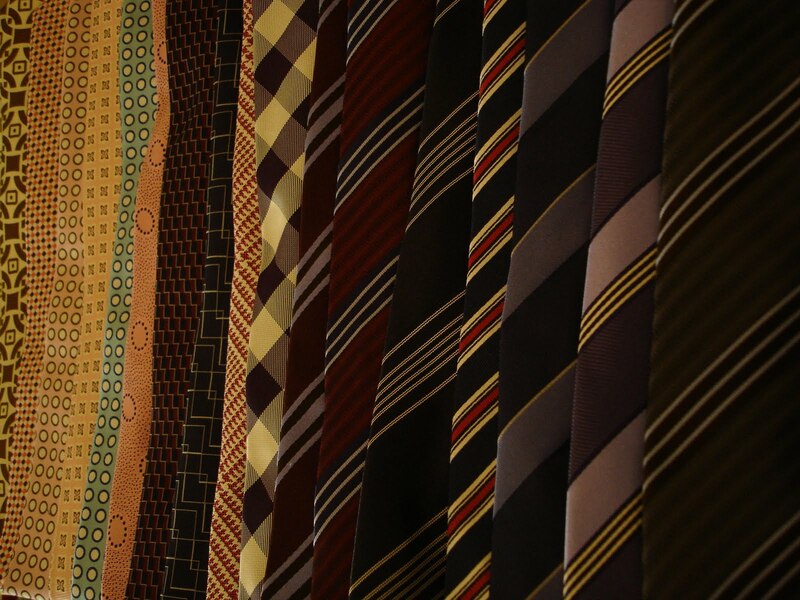 Most of the brand names you encounter on an average trip to your clothier of choice think Michael is about the most stylish guy to tie a tie. The two scarves pictured in this post, currently available at Drakes-London, are particularly classic, versatile and compatible. 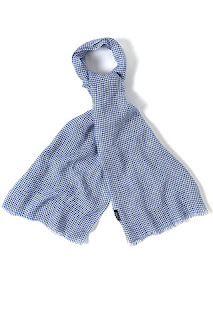 Worn lightly wrapped around the neck or folded and looped in a European fashion, the summer scarf takes on the look of something picked up in Marrakesh or Paris. It has a certain exotic feel to it that is more world traveler than fashion victim. That said, this kind of nonchalant elegance is a delicate balance. Summer scarves need to have a rich but muted coloring to them, and a classic but unfussy pattern; masculine yet relaxed and un-stuffy. 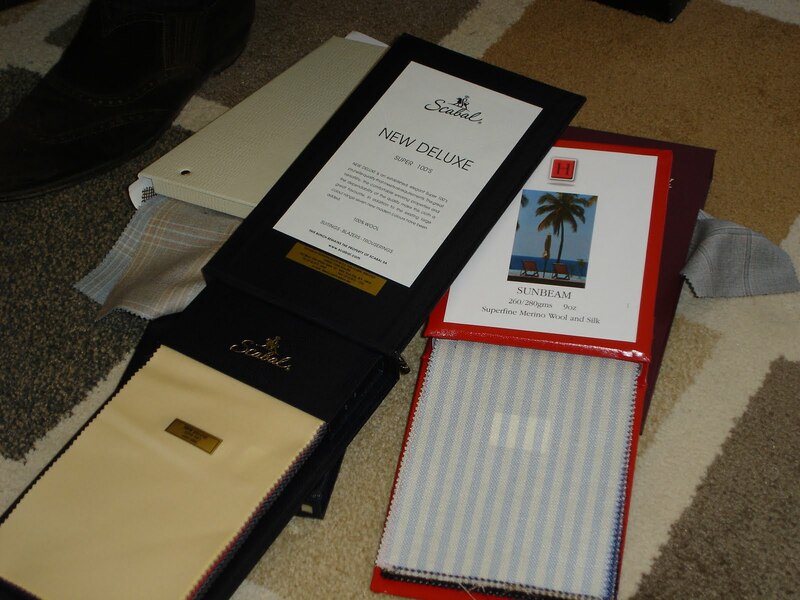 Drakes’ scarves in particular are feather light, extremely malleable and made from some exceptional fabrics. Another point, and frankly this is more important, is to not care what anyone else thinks. This is a leap of faith for a lot of men and ultimately if it’s not for you then don’t wear it. 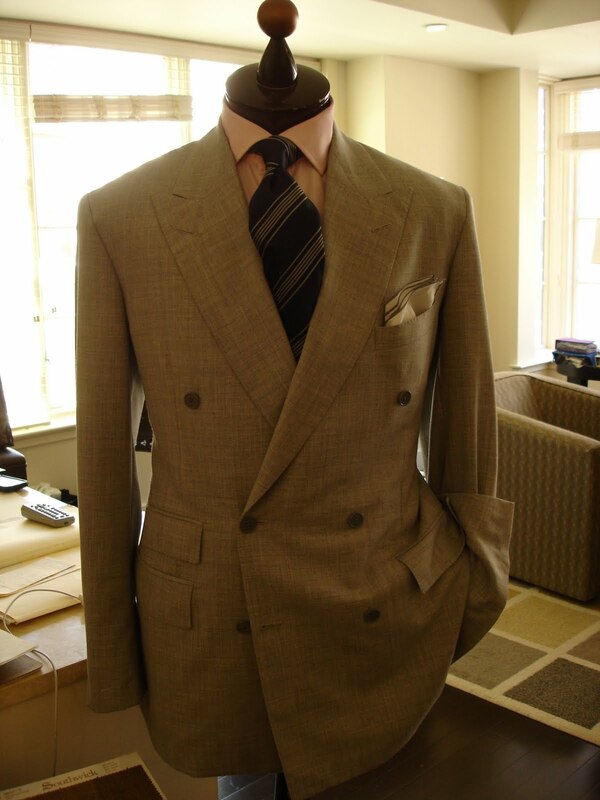 It’s a personal look that comes nowhere near American Ivy League, but it is nonetheless a classic, classy look. My wife actually likes the look and, frankly, that surprised me. 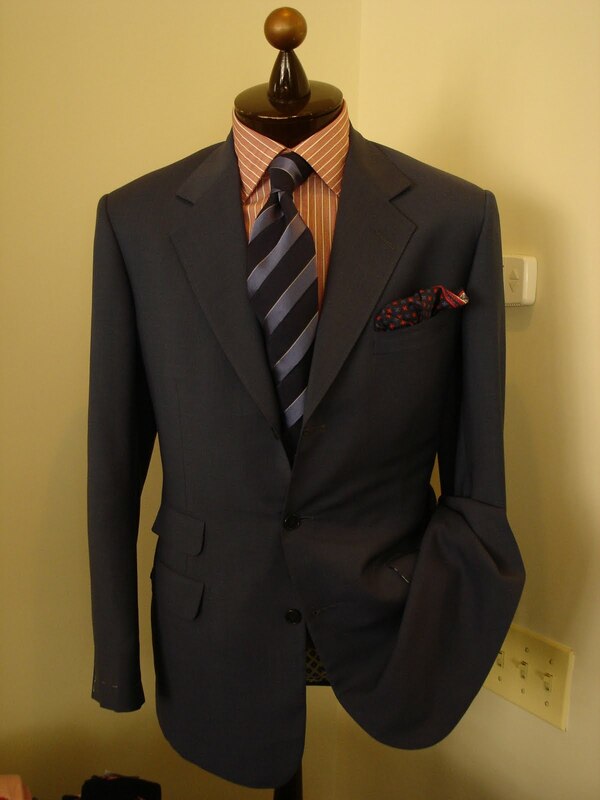 But when paired with a light sport coat or blazer it can feel quite natural. In my case, with worn-in khakis and a white oxford, my outfit had that nice thrown together, been-around-the-world look to it. How do you reposition a brand that’s already successful in your home market for customers across the ocean? 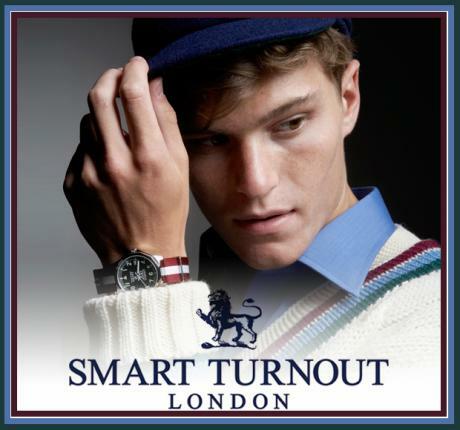 Take a page from the playbook of British apparel and accessories retailer Smart Turnout. 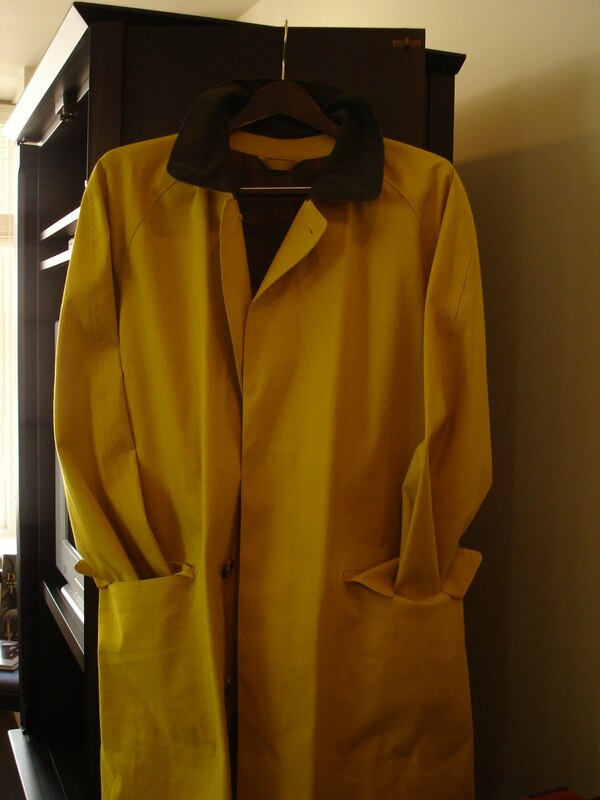 OTC has long been an admirer of this creative and authentically English brand. Originally built around jumpers (sweaters to us Americans) executed in British regimental colors, The Smart Turnout brand moved on to outstanding enameled cuff links and regimental ties. 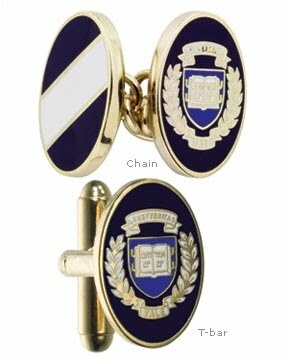 Initially, the company continued with the regimental themes but branched out a bit and produced some American Ivy League inspired ties and cuff links. Throw in some very popular nylon canvas watchstraps and Smart Turnout was on a roll. But rolling where? The brand was expanding at a very healthy pace in its home market but founder Philip Turner had bigger ideas and wanted to capture the American Market as well. 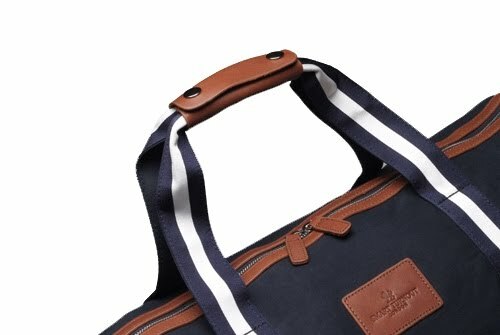 How do you re-brand a distinctly British company for American consumption while offering primarily British/inspired products? Take a look HERE and find out. The approach? Reestablish Smart Turnout as a sleeker “city” brand without totally abandoning its “country lifestyle” roots. Build up the brand’s storyline by creating an overall brand narrative woven throughout the paper catalog and recently relaunched website (a great one by the way). The result? Increased sales, better name and brand recognition and deeper American market penetration. This strategy also helped to build stronger association with Smart Turnout’s British heritage via the new “London” tag line in its name that, paradoxically, helps to establish brand value and exclusivity here in the States. Overall, a great job of holding on to the core values, quality and uniqueness that made the brand initially successful while thoroughly modernizing everything about it. I think the best compliment is one noted by an OTC reader who told me that he could tell the whole brand had been refreshed and rebuilt, but he could not really pinpoint what was different – it just looked better. 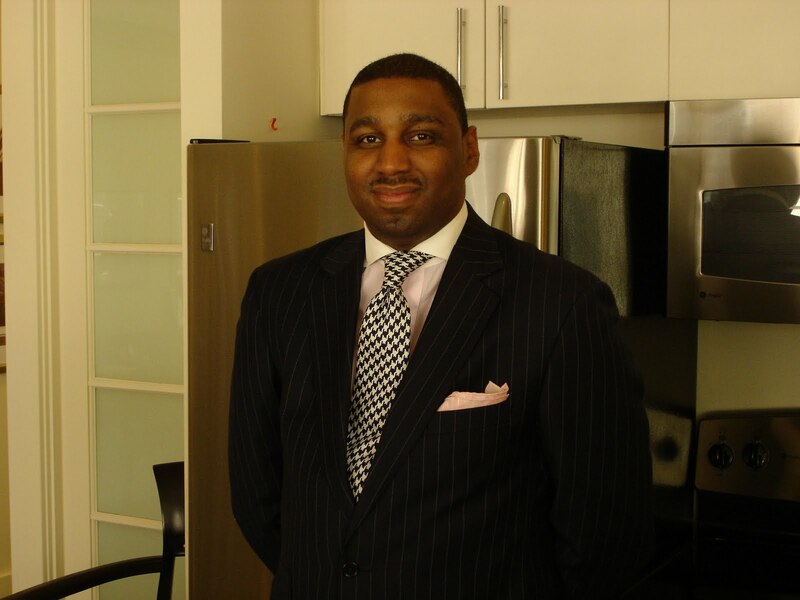 Kennedy’s All-American Barber Club, the upscale barbershop franchise I recently profiled, will be hosting it’s Rockville, Maryland, Grand Opening and Open House tomorrow, Wednesday, April 14th from 5:00 to 7:00 p.m. The evening’s proceeds will go to benefit the Wounded Warriors Project. 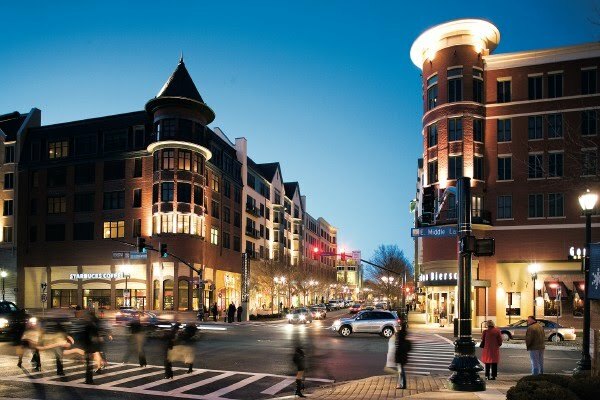 It’s going to be a lot of fun; food and beverages will be provided, along with grooming services and tours of the newest Kennedy’s Club located at 110 North Washington Street near the Rockville Town Square (free parking is located at the rear of the building). 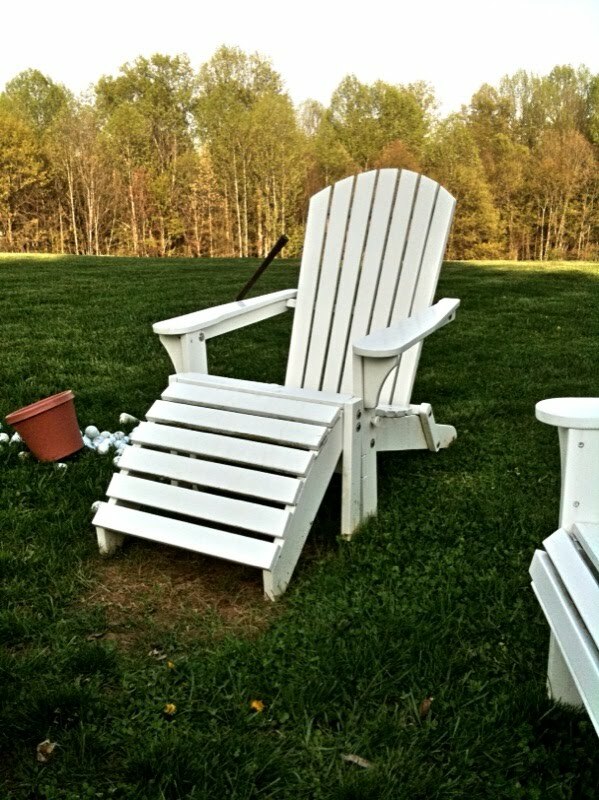 I plan to swing by myself. Read more about the company here. Attendees will be able to purchase signature haircut certificates for $25 each and signature haircut and shave certificates for $60 each, with the total proceeds going to support the Wounded Warriors Project. 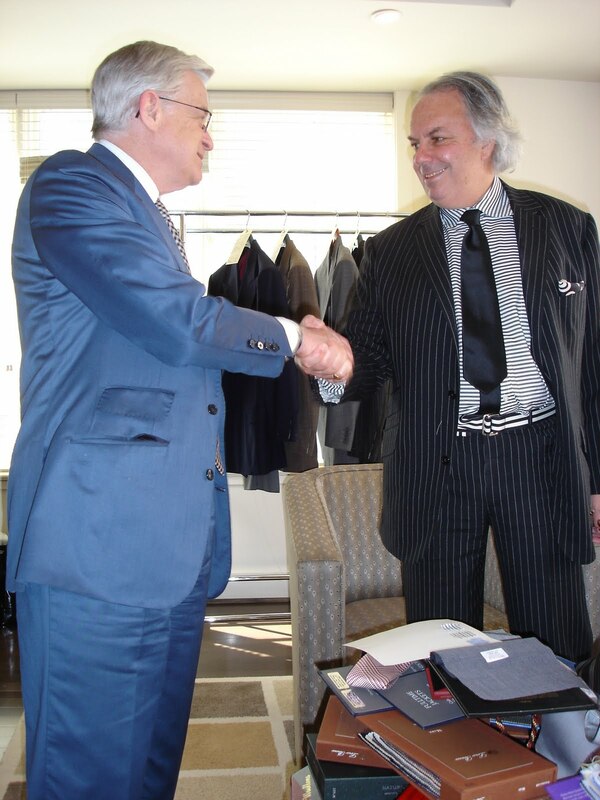 If there is one name in the world of menswear that genuinely deserves the overwrought moniker of legend, it’s Alan Flusser. 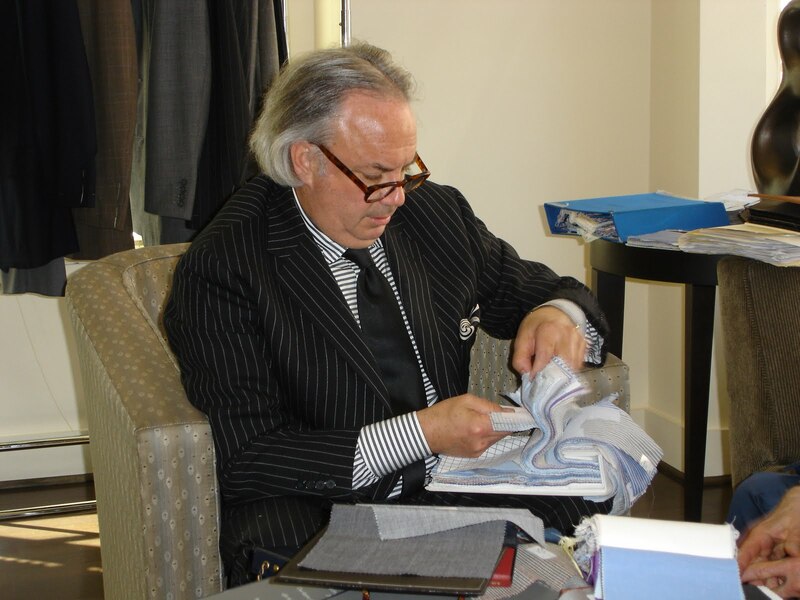 Alan is not just a menswear designer, not just an author, not just an innovator and not just the guy who invented Gordon Gekko’s signature look for the movie Wall Street (only one of several movies for which he worked his magic). 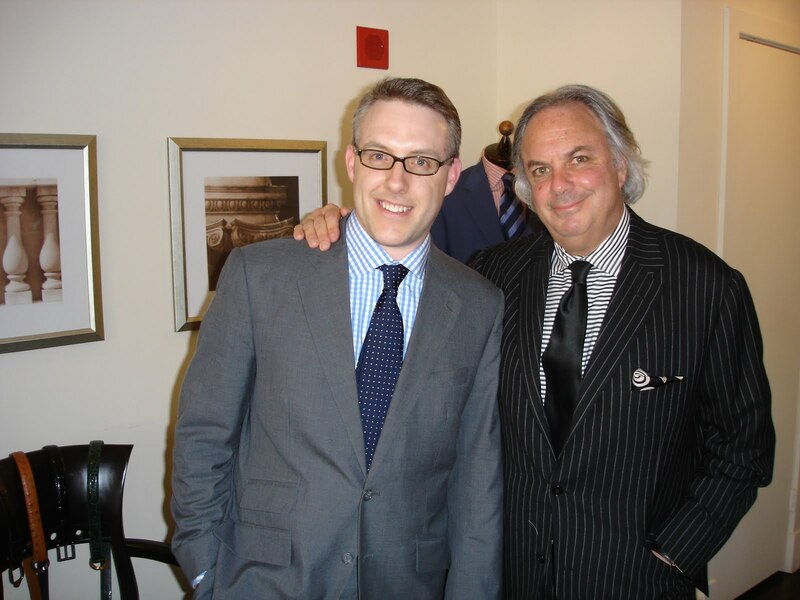 He is also one of the most well-versed and well-read menswear experts alive today. Flusser is such a close friend of Ralph Lauren, that Lauren asked him to write his biography, which he’s currently working on. He’s also a very nice guy. So, it was with thanks to ADG, a longtime friend of Flusser, and genuine excitement that I stopped by the DC office of Alan Flusser Custom. 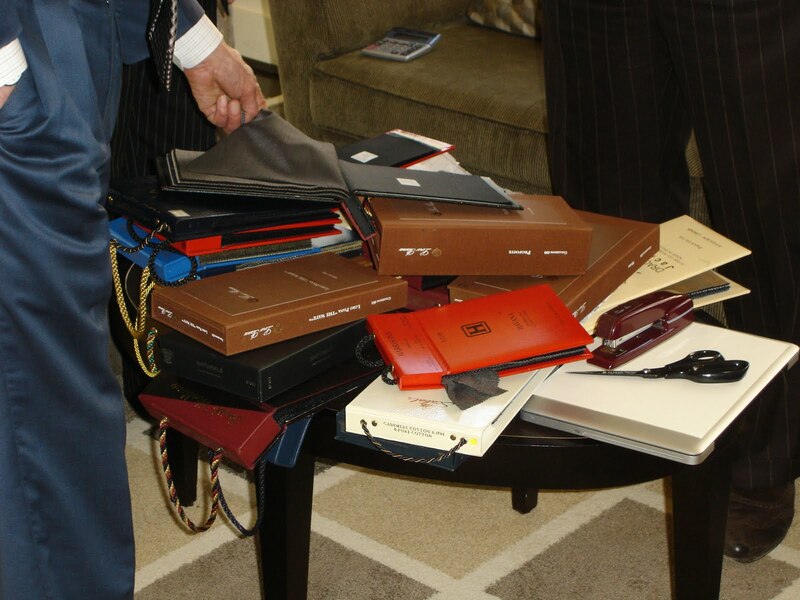 The DC “office” was actually a very nice hotel suite converted to a showroom/salon for Alan’s Washington clients. This trip to the nation’s Capitol happens four times a year and speaks to the commitment Alan and his team have for their clients. 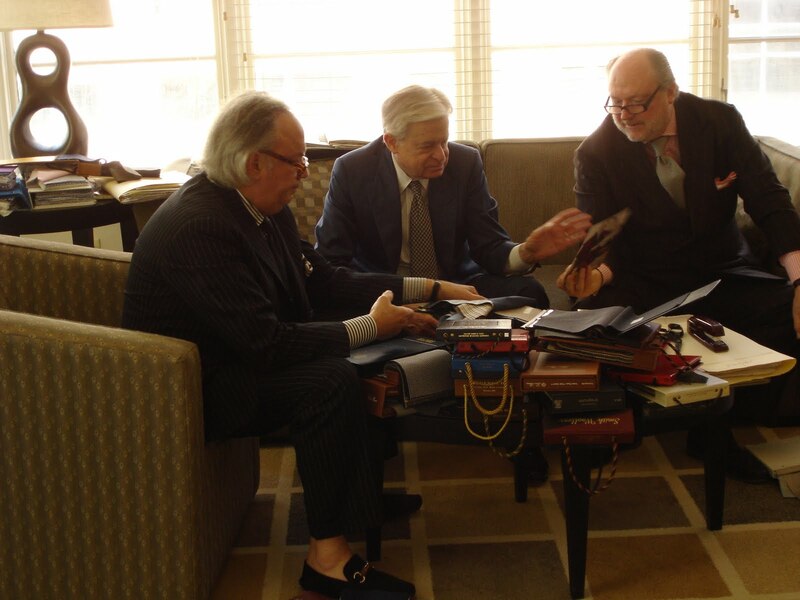 In between visiting clients and friends, I had the chance to chat with Alan; Mark Rykken, Alan’s longtime number two and former head of DC’s venerable Britches; and personal clothier Karim Ferrell. Team Flusser exudes a genuine love of clothing and an unwavering assertion that dressing well, dressing to fit your coloration and frame, comfort and personal style matter even more today. Among other things, we discussed the lack of real guidance for many young men who are looking for role models when it comes to dressing. Too often, magazines and celebrities, “style experts” and self-professed consultants focus on ephemera like of-the-moment trends and “looks” that, frankly don’t look very good. That’s not dressing; it’s dressing up like someone else. 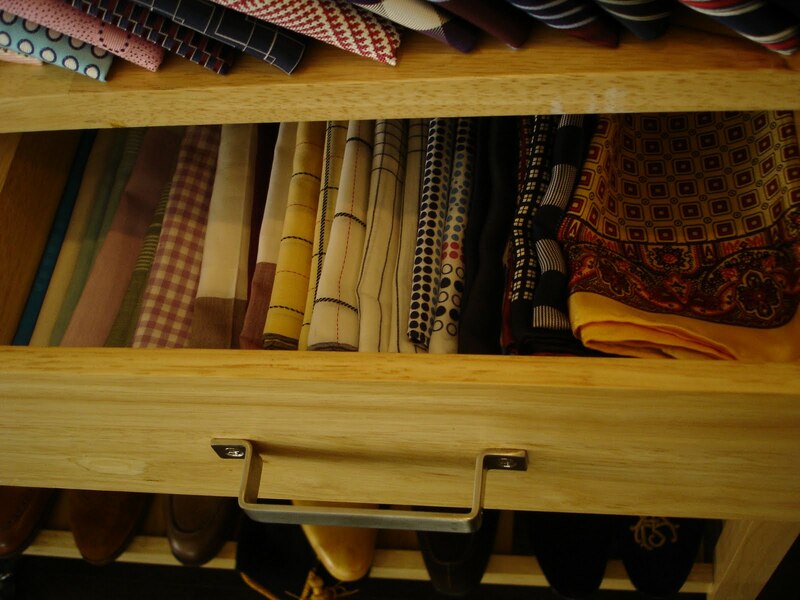 Flusser knows from dressing well and the reason he knows is because he lives and breathes menswear but he is not locked in the past. He as an attitude and persona that is forward looking, intellectually aggressive but not rude. 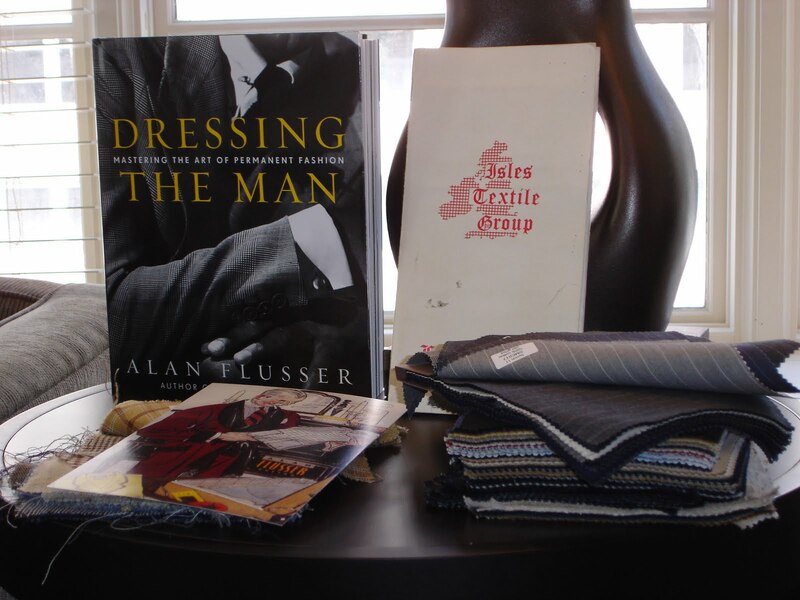 There is the Flusser way to dress and that’s what you need to buy into when you ask Alan and his team for help with your wardrobe. It’s both elegant and casual, formal but witty. Alan himself was wearing black and white; knowing what colors, patterns and textures work on you the most important thing, he noted. 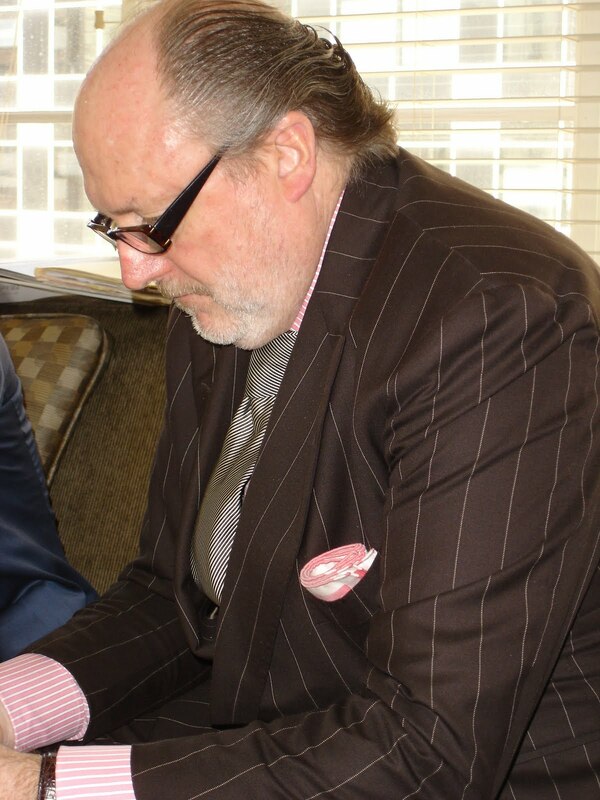 Chalk striped suit, horizontal striped shirt (a Flusser/Gekko signature), solid silk tie, striped grosgrain belt and, almost incongruously, suede driving moccasins sans socks. Natty, personal, assertive but without the “aren’t I clever” attitude. It’s just how he dresses. Below are some more shots from the afternoon. What’s Tiger Wearing? It’s In The Script. 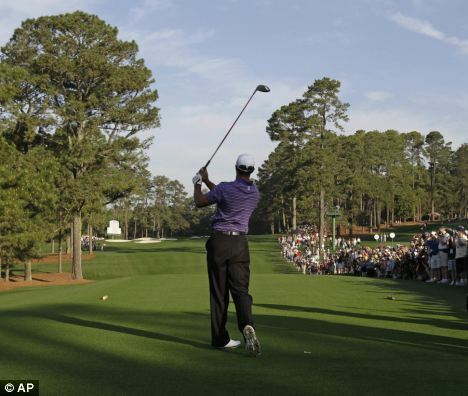 Down in Augusta, Georgia, the Master’s golf tournament just got underway. While it’s one of the world’s leading venues for any golfer, this year it’s all about Tiger Woods. 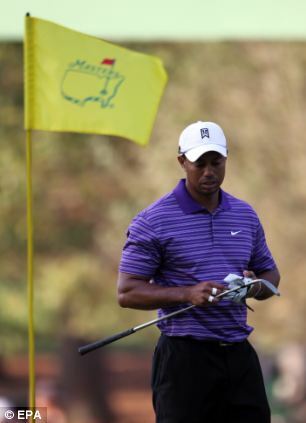 I’ll bypass the obvious storyline here because I want to point out something else: what Tiger’s wearing and why. To the surprise of many, Nike, a keystone sponsor that stuck with the embattled golfer, scripts its athlete’s wardrobes. While the practice of a sponsor dictating athlete’s uniforms is standard in team sports like football, soccer and baseball, golf is a purely individual sport. Sure, apparel brands like Nike, Callaway and Ping all sponsor players, but who knew that for Trevor Immelman Saturday is lyon blue body mapping graphic polo day? No surprise that Nike has this down to a color coordinating science. About a week ago, Nike sent me a detailed wardrobe schematic, complete with product SKUs, outlining in detail what each of Nike’s 11 sponsored athletes will be wearing every day of the tourny. There is a certain amount of leeway when it comes to mixing and matching pieces. But for the most part, the golfers are locked in by contract to wear the desired combo – or at least choose only from an approved apparel grouping. For example, I knew with a high degree of confidence that today Tiger would be wearing a dark grey DRI-Fit open stripe polo (style# 359363-021), black pants and a black hat. As it turns out, he appears to be sporting tomorrow’s white hat and Saturday’s lilac frost textured strip polo (#359361-505). Well, after all, he is still Tiger.